The cheapest dance mat on the market, with arrows in both standard and diagonal directions. This mat is your ticket into the world of action and popular dance simulators. Dancing on this mat is not only dance and sport but primarily fun. Its use is very easy: connect to your computer, start the software, choose your favourite song and dance according to the arrows displayed. The PlayDance Ultimate demo version can be downloaded from the site playdance.cz, PlayDance Edition contains a license key for the full version of PlayDance Ultimate. The pad is suitable for beginners but also for those who want to try medium difficulty tracks. The pad is lightweight and very thin, making it very compact and suitable for frequent transport. It comes with Stepmania 3.9 software (for MS Windows) and 213 songs that can be easily expanded with your own. Warning: The manufacturer's exclusive lifespan guarantee for this dance mat is 18 months. This means that if any damage occurs to the mat (except for intentional damage) for example during use, the manufacturer will replace it with a whole new piece. This means you do not have to worry about first games when players tend to stomp on the pad harder than necessary, or even advanced games to challenging tracks when the pad is fully burdened. The warranty period for manufacturing defects is of course 24 months. For shipping to other EU countries visit this page X-PAD Basic Dance Pad PlayDance Edition. 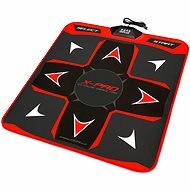 Für Versand nach Deutschland, besuchen Sie bitte X-PAD Basic Dance Pad PlayDance Edition. Chcete doručit zboží do Česka? Prohlédněte si X-PAD Basic Dance Pad PlayDance Edition. Chcete doručiť tovar na Slovensko? 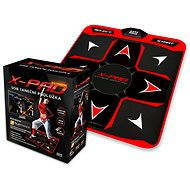 Prezrite si X-PAD Basic Dance Pad PlayDance Edition. 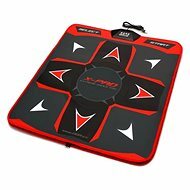 Für Versand nach Österreich, besuchen Sie bitte X-PAD Basic Dance Pad PlayDance Edition. Magyarországra történő kiszállításért tekintse meg ezt a termékoldalt: X-PAD Basic Dance Pad PlayDance Edition.